Each year generous supporters like you join us for the exciting annual North Texas Giving Day – this year it will be September 17 from 6 a.m. to midnight. Your generous support makes a meaningful difference to the breast cancer patients and survivors helped by Foundation 56. As you know, Foundation 56 is changing lives every day by/through breast cancer education, mammogram screenings, diagnostic testing and more. 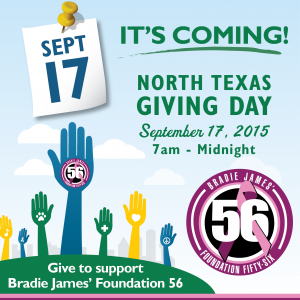 On September 17th, 2015 North Texas Giving Day, your financial gift will help us receive extra funds for our work in the community. In total, more than $2 million dollars in bonus funds and prizes will be available that day! CLICK HERE to donate via the North Texas Giving Day website and you can make a difference with your gift to Foundation 56. Here’s the really exciting part: Every gift made through NorthTexasGivingDay.org on September 17th helps our chances of winning prizes given throughout the day ranging from $500 to $5,000! With more than 70 total prizes being awarded throughout the day, our chances to maximize your gift are great! Just imagine if we could add dozens more free mammogram screening dates with our mobile mammogram unit! Make your gift on September 17th by clicking here. As a member of the Foundation 56 team, we’re asking you to help spread the word through word of mouth, online via social media posts and more. Follow us on Facebook & Twitter so you can share in the excitement of a day of giving and remember to give on September 17th.